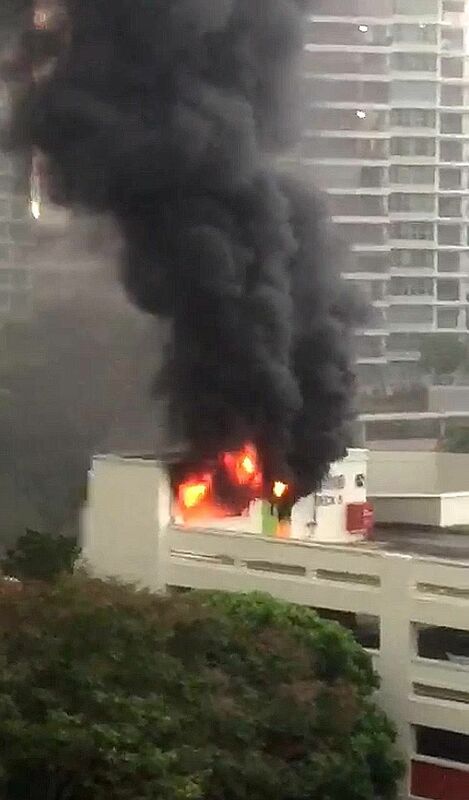 Huge plumes of black smoke billowed skywards after a fire broke out at a multi-storey carpark at Bishan North Shopping Mall yesterday afternoon. No one was injured and no vehicle damaged in the fire, the Singapore Civil Defence Force (SCDF) told The Straits Times. Discarded items were found in the blaze that broke out at the fifth-storey staircase landing of the carpark in Block 282, Bishan Street 22. SCDF was told of the fire at 2.57pm and sent three fire engines, a Red Rhino and a support vehicle. The fire was put out with a water jet and, within an hour, vehicles were entering and leaving the carpark. But the affected staircase was cordoned off. Likewise, the roof. The cause of the fire has yet to be established. One resident, who declined to be named, said discarded cardboard boxes were often seen at the affected staircase. "I'm relieved that no one was hurt," said Senior Minister of State Josephine Teo in a Facebook post yesterday evening. She is the MP for Bishan North ward in Bishan- Toa Payoh GRC.